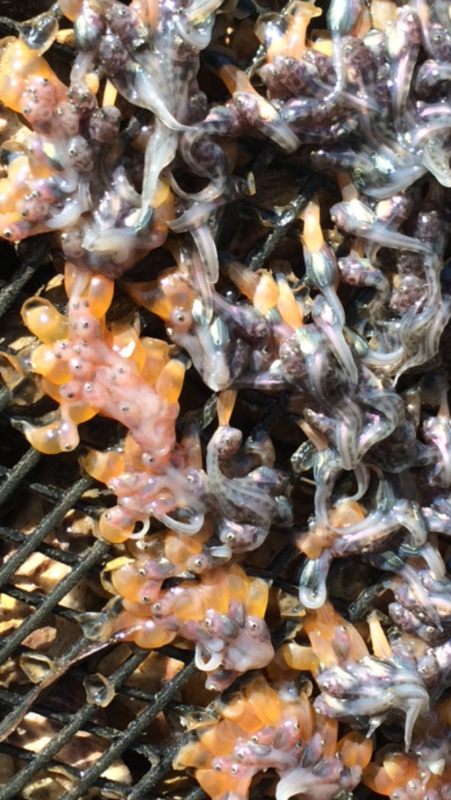 Zack's photo shows an egg mass from the many gunnels that have been using the oysters as habitat. The oysters and the bags they grow in provide essential habitat and protection for many fish species. Paul's photo shows oysters and eelgrass co-habitating in Willapa Bay, WA. Both are critical habitat to their marine ecosystem. Sue Shotwell & Robert Johanson from the Nisqually Indian Tribe took this photo of Gunnel egg masses within their cultch seed bags. The space within the oyster cultch bags provides protection and essential interstitial space for spawning to occur. 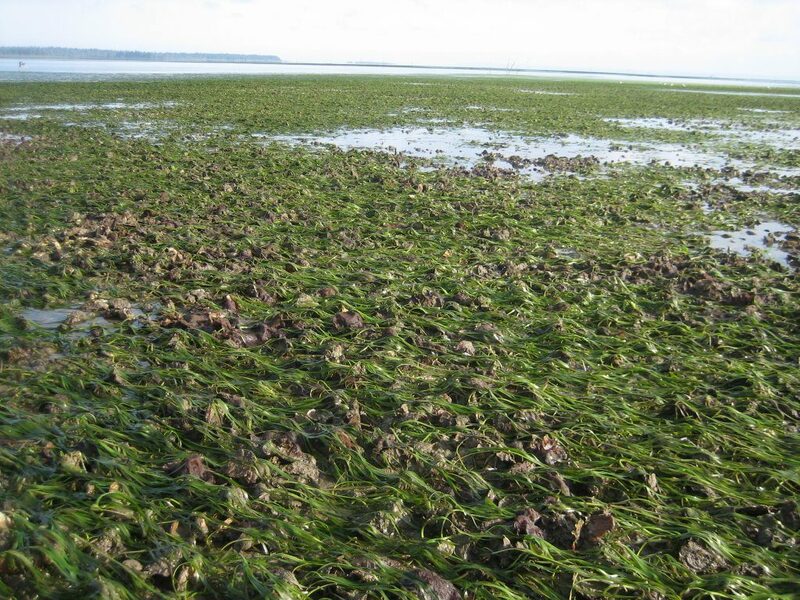 Weatherly's photo shows how a suspended culture of oysters provides ample space for annual kelps and seaweeds to grow on. The kelp sets in the winter and grows at an astonishing rate in the spring, making an underwater forest under the farms. 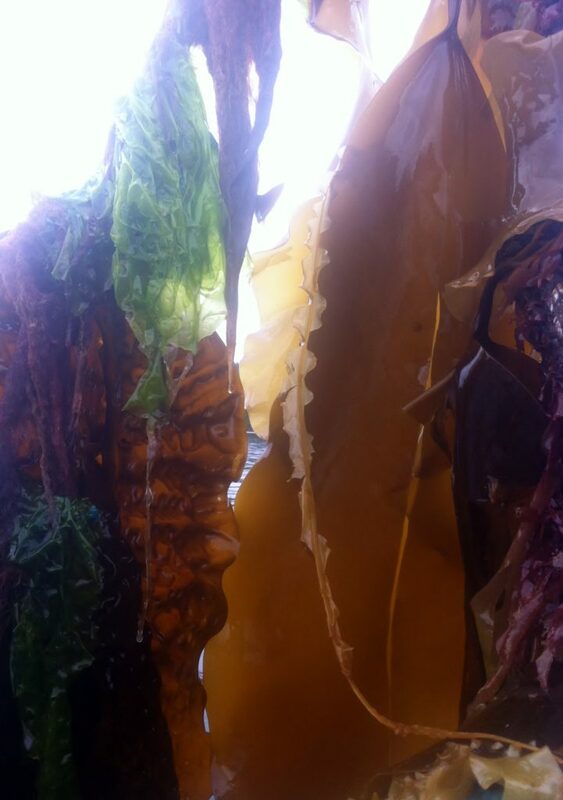 The kelp provides habitat for invertebrates and fishes and is also used by herring to spawn their eggs on. Photo taken in Homer, AK. 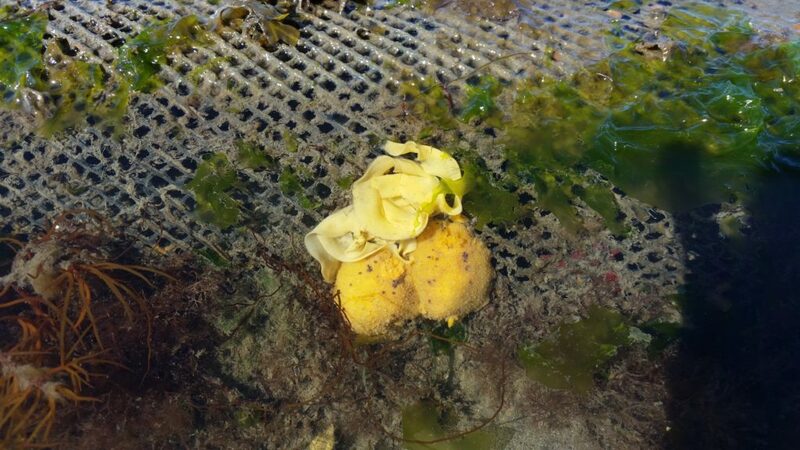 Bill's photo shows sea lemons (Doris montereyensis) mating and laying eggs on a predator net in Samish Bay, WA. 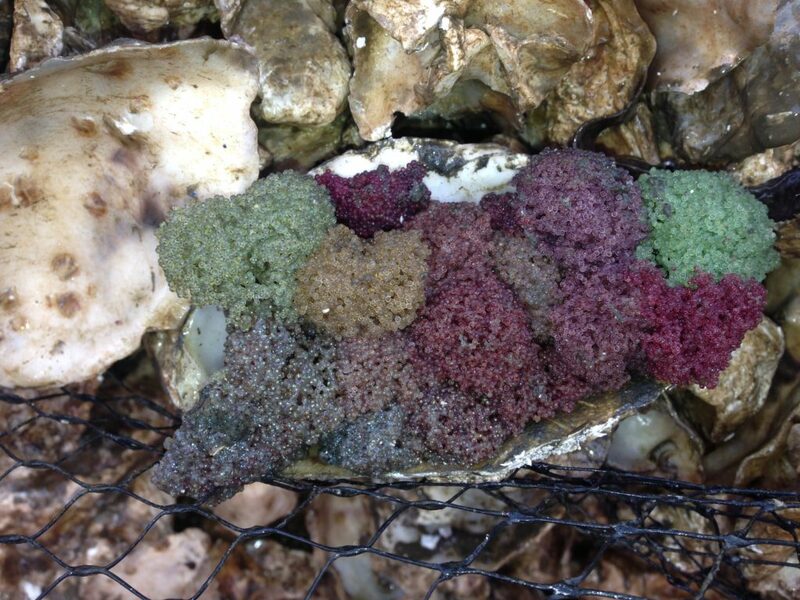 This species feeds almost exclusively on sponges which are abundant on the nets on the Chuckanut Shellfish farm. Photo taken in Shelton, WA. 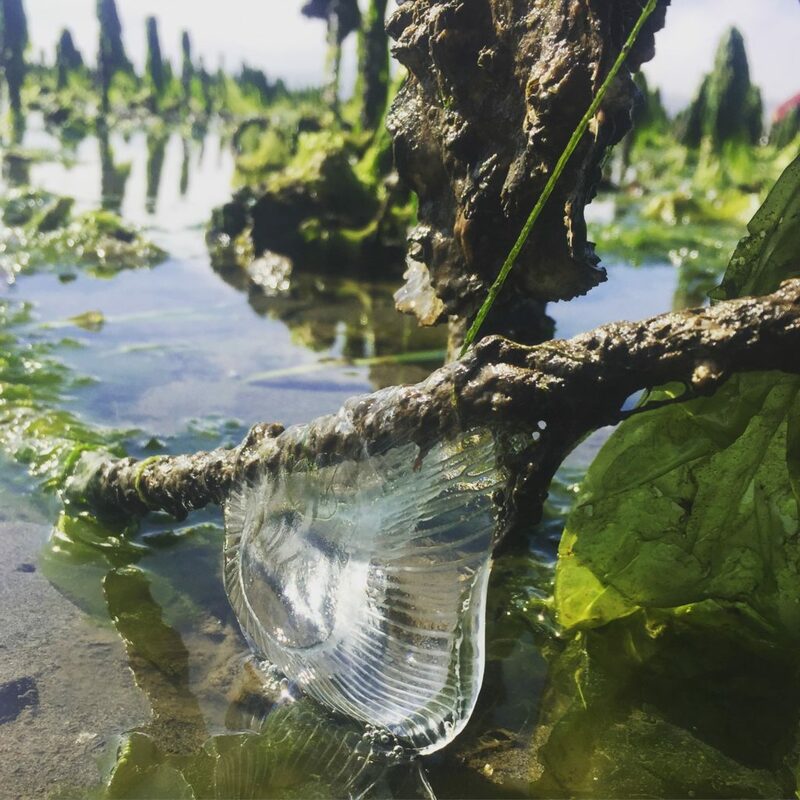 Nathan took this photo in June showing a Pacific oyster's Longline beds in Tillamook Bay, OR. Longline oyster beds provide excellent protection from predators for all kinds of sea life. From various types of seaweed to multiple kinds of shellfish, as well as the local jellyfish hangout spot. Becky's photo is of Sculpin fry who seek refuge under oyster grow bags. Aquaculture gear provides additional habitat for various intertidal organisms! 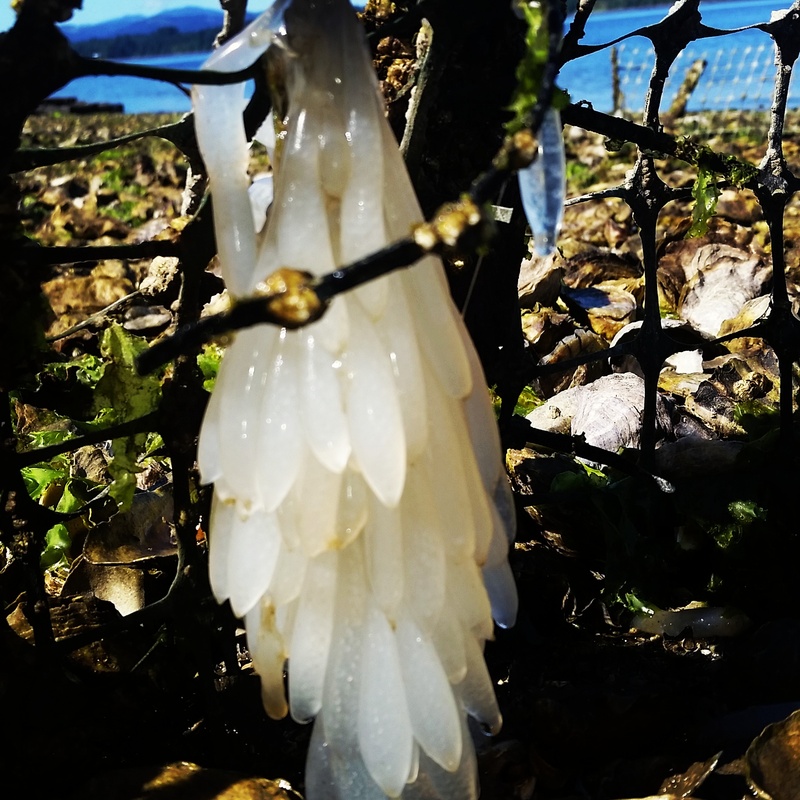 Shina's photo shows Herring spawn on an oyster fence. 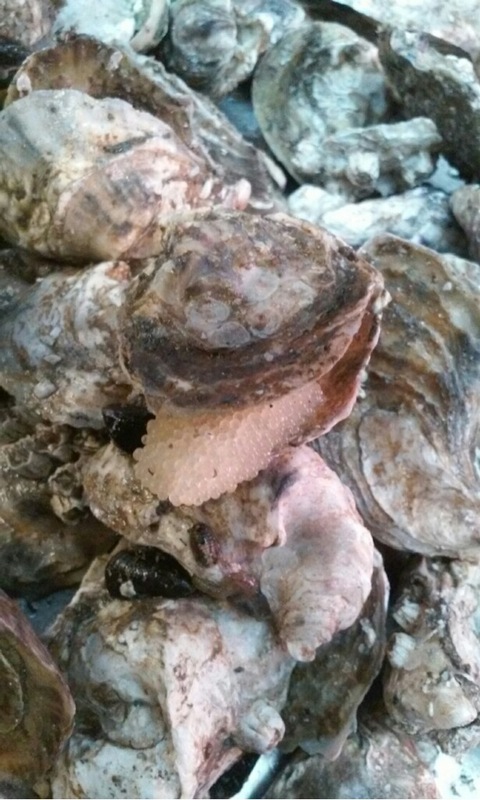 Johnny says: "The power of oysters on water quality." 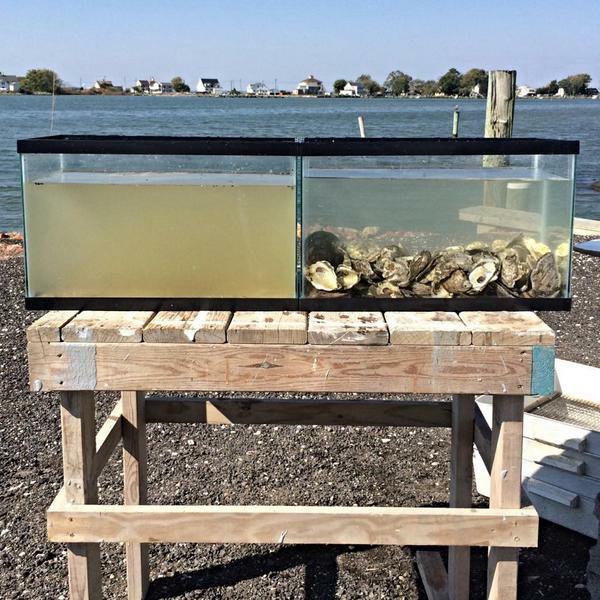 His photo depicts how oysters clean the water; the tank on the left before the oysters, the one on the right shows the same water after oysters were added to the same water source. As you can see it shows how they filter and clean. Weatherly's photo shows Mytilus trossulus. They filter 2-3 liters of water per hour while they feed and respire. 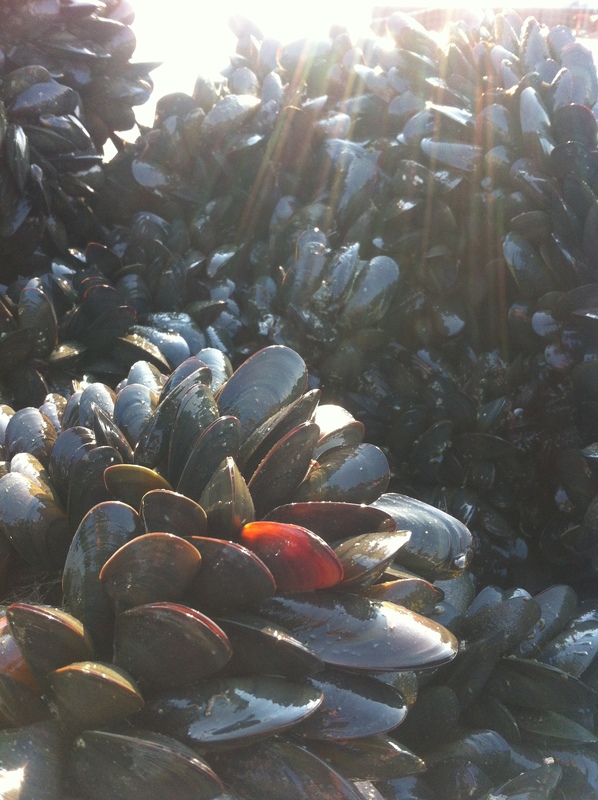 Just one 40' x 40' mussel raft stocked at capacity can filter 3 million liters of water per hour. By filtering water mussels have significant positive effects on nutrient and sediment removal from the water column. Some Nutrients are made into the body tissues of mussels that we later eat, the rest is excreted as waste which ends up on the seafloor, helping stimulate the rate of decomposition within the ecosystem. This means bivalves such as mussels have profound roles in controlling boom and bust cycles of seasonal phytoplankton blooms. Shellfish help stabilize marine environments leading to higher overall productivity and diversity of species.